Measurement System is one of the vital aspects of Quality Management. It is a mandatory requirement (clause 7.6) of ISO9001:2008 that your organization must have a system for control of monitoring and measuring equipment. That means, you need to calibrate your measuring instruments and inspect the measuring gauges & inspection jigs at regular intervals and ensure that these items are available and fit for use. Equipment calibration is a requirement of other standards such as ISO14001 and OHSAS18001 also. Apart from establishing a system for equipment calibration / gauge inspection, Six Sigma implementers need to also estimate the repeatability and reproducibility of measurements (R&R studies). It is also known as Measurement System Analysis (MSA). Our software can help you track the equipment calibrations & gauge inspections, issue/receipt of these items (internal/external), and do the statistical computations involved in R & R studies. In short, this relatively inexpensive piece of software could be of great help to ISO9001:2008 and Six Sigma implementers. What are the salient features ? Systems approach to Calibration Management. Tracks history of any device from 'new' to 'scrap' stage. Scale-wise data entry is allowed for multi-scale instruments such as multimeters, oscilloscopes, etc. 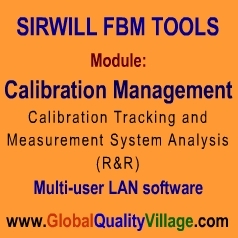 If required, you can also define different calibration intervals for various scales. R & R computations for measuring instruments (variable data) using ANOVA method. Can also compute R & R for Ok / Not OK type inspectons (attribute data). Can generate month-wise Calibration / Inspection Schedule. Template-based data entry for ease and standardization. User-friendly data entry screens with in-built error checking. Password protected login ensures greater data security. Generates over 45 reports to view, print or save as pdf files. Very easy to install, without help from any software expert. User manual (in pdf format). User training (optional) in Kerala (India). Our calibration management software comes in two editions (LITE / STANDARD) to suit varying needs. We highly recommend STANDARD edition for users having a number of measuring instruments, and, LITE edition for only those having very few instruments. Please click here to view a PDF Demo of the software. Kindly click here to view a PowerPoint Demo of the software. In case of download version, you can download the software installation files from our website within six hours of making the payment. (Files compressed in WinZip format, takes just 10 minutes to download).